Getting a wings tattoo is a beautiful and meaningful way to express your love of freedom and movement, remember someone you loved who has passed away, to demonstrate your faith, or to have a constant reminder of your ability to overcome fear, obstacles, and whatever life throws at you. 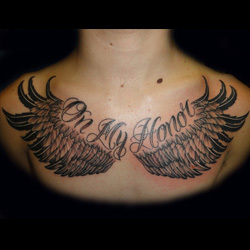 Wings tattoos can vary in size, color, and design, so work closely with your tattoo artist to make sure your own personal meaning comes across in the finished product. This style of tattoo can include a variety of different winged creatures, such as angels, various animals or birds, and even insects, thus making this a great tattoo choice for anyone wishing to demonstrate their affinity with one creature or another. 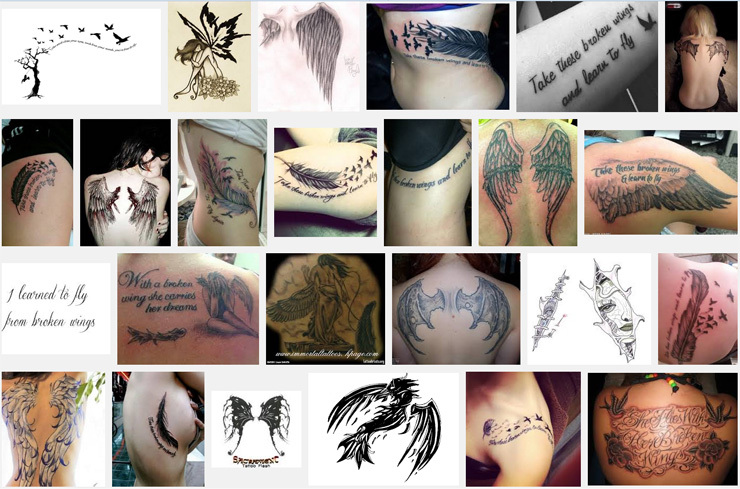 As such, wings tattoos are a great choice for anyone with a deep love of nature and her creations, and they can provide a more unique design than simply getting a tattoo of a given animal. 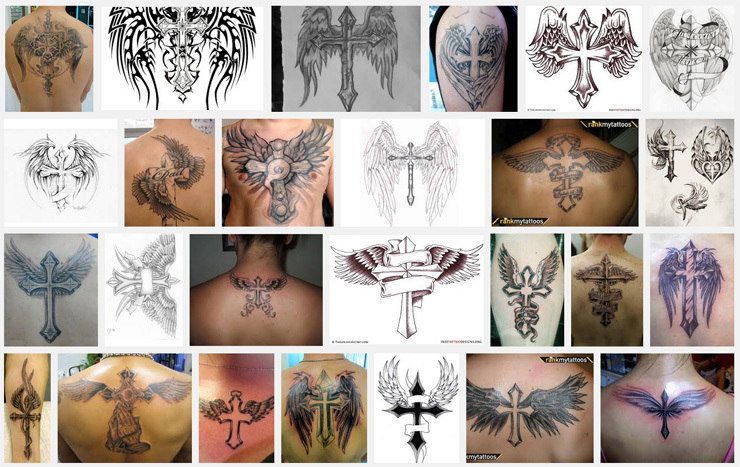 There are several different variations of wings tattoos that you can get done, each one with their own distinct meaning. 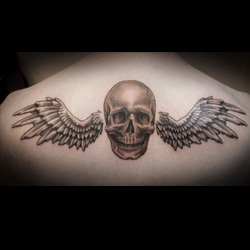 With such a wide variety of designs to choose from, wings tattoos look great on both men and women, and they can easily be adjusted to be a small design on the ankle to a full-back piece. 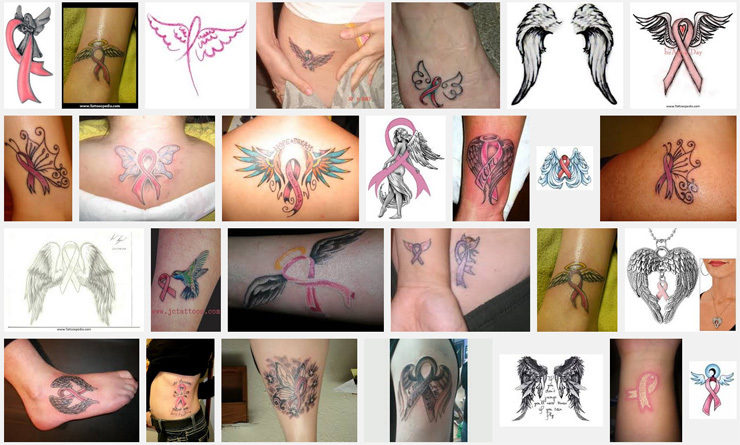 Sometimes the simplest design is the best, though the basic angel wings tattoo can still be completely customized to reflect your own personality, struggles, or heartfelt losses. 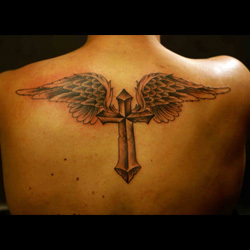 You may choose to make this tattoo a true statement piece by having the wings cover your entire back: this can demonstrate your belief that you will be lifted up and reside with the angels someday, while a smaller set of angel wings placed discreetly somewhere can be a constant reminder that your guardian angel is always watching over you. 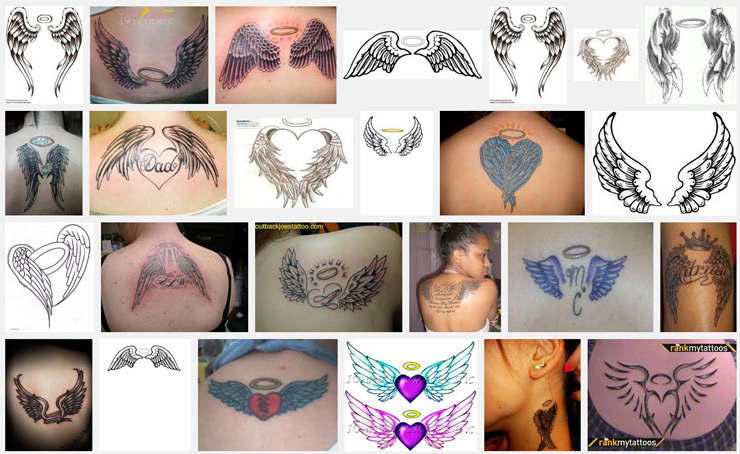 Getting a tattoo of angel wings with a halo atop them is a way to remember a loved one who has passed away and is now an angel in heaven. This tattoo, though seemingly simple in its design, can become quite personal if you add the name or initials of the person below the wings, or include a meaningful phrases such as 'Gone but not forgotten'. 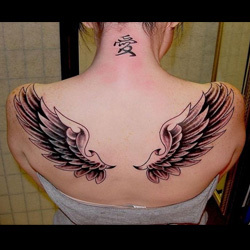 You can also vary the color and design of this tattoo: you may want to keep things simple and just have an outline of the wings and halo, or you can color both in with white and gold respectively. 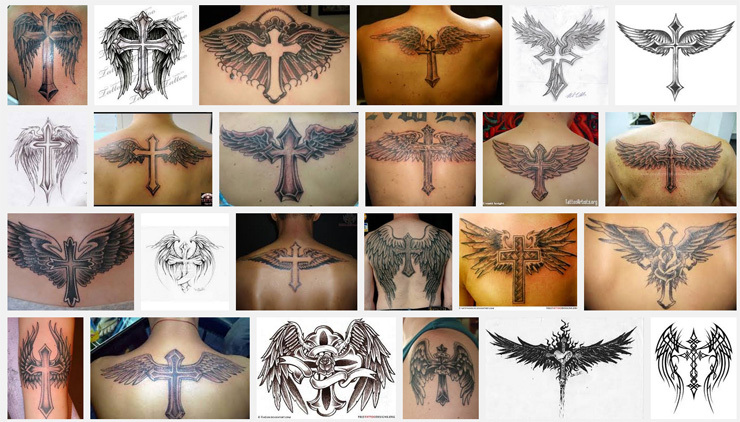 Crosses are a particularly popular design with many tattoo enthusiasts, and getting a winged cross tattoo is a great way to make sure your design stands out from the crowd. The winged cross can be a statement of religious freedom, a tribute to a lost loved one, or a reminder of your own near-death experience. One way to personalize this design is to put the name of the lost loved one on the cross, or the date of your near-death experience. You can also add a crown of thorns to the cross to demonstrate the suffering you've gone through, or as a reminder of Jesus' suffering on the cross, thereby also depicting an important image in Christianity. So many of us have lost someone close to us with breast cancer; it is a merciless disease that takes thousands of women's lives each year. 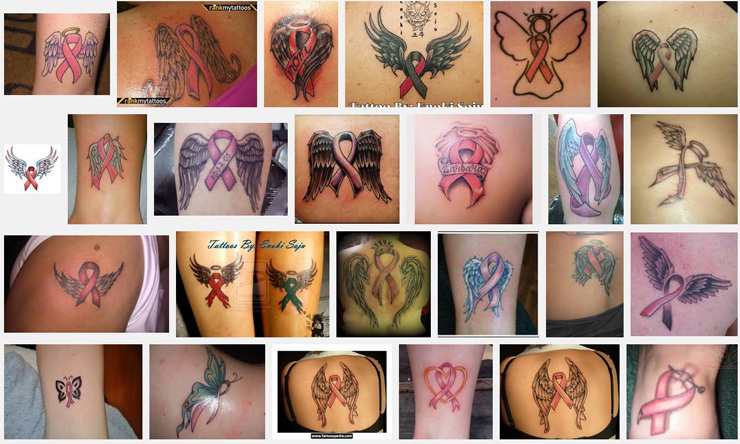 An especially poignant way to remember someone close to you who succumbed to this disease is to get a pink breast cancer ribbon with angel wings tattooed. 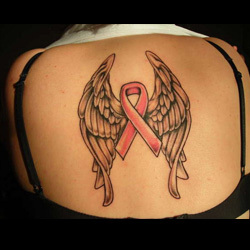 This design can range from stark and simple - a black outline of the ribbon and wings - to much more ornate, with plenty of color, detailing, and added script with the person's name or a meaningful phrase. Position the tattoo above your heart to symbolize that they are always present with you, or place it behind your ear to remind yourself to listen for their spirit. 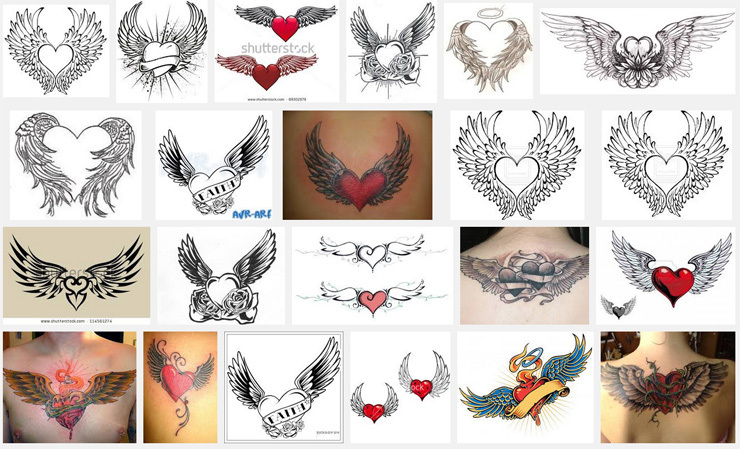 The heart is a potent symbol in its own right, and adding wings to this design will further increase its meaning. 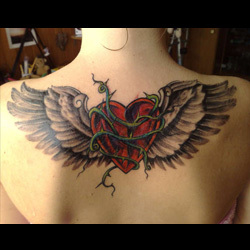 Hearts can represent love, strength, and energy, while wings often designate freedom and the ability to fly away: thus, the combination of the two symbols can demonstrate your free-spirited nature and love of freedom. 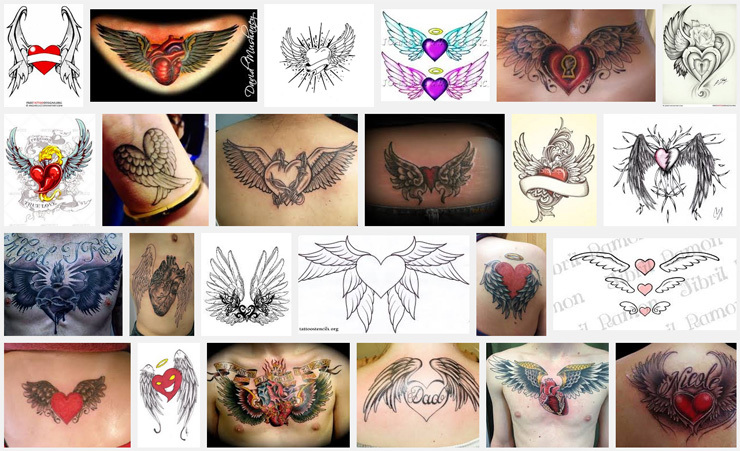 Another design idea for this tattoo would be to get your partner's name or a loved one tattooed in the heart; together with the wings, this design will demonstrate how they are always with you. 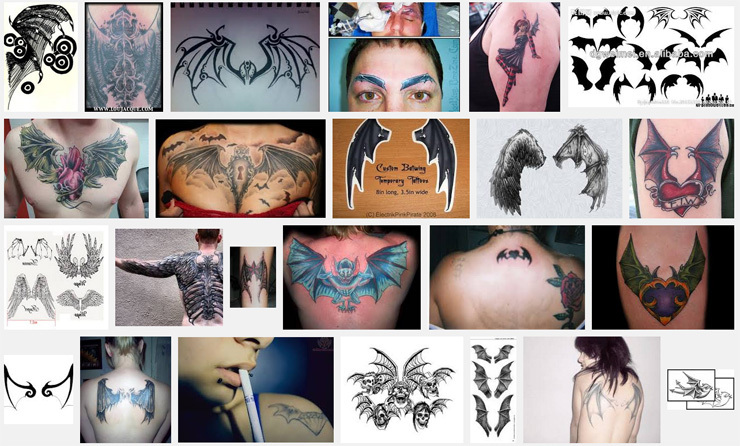 Batwings were often used to represent fallen angels, as opposed to the white feathery wings that we associate with angels in heaven, so getting a batwings tattoo can demonstrate your fallen state. 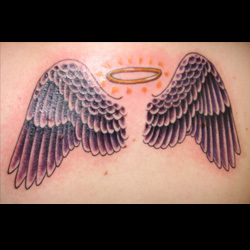 One design idea to highlight this meaning would be to get the wings done over your shoulder blades, as many angel wings tattoos are done, making a clear parallel between the bat and angel imagery. 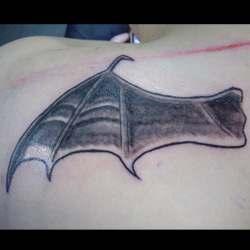 But bats were also seen positively in other cultures, such as in China where they symbolize good luck and happiness. One design that would work with this meaning would be to get the batwings done around the Chinese symbol for 'luck' or 'happiness'. In addition, because Chinese symbols are often done in black, this is a coherent design that will look great on a man or woman. 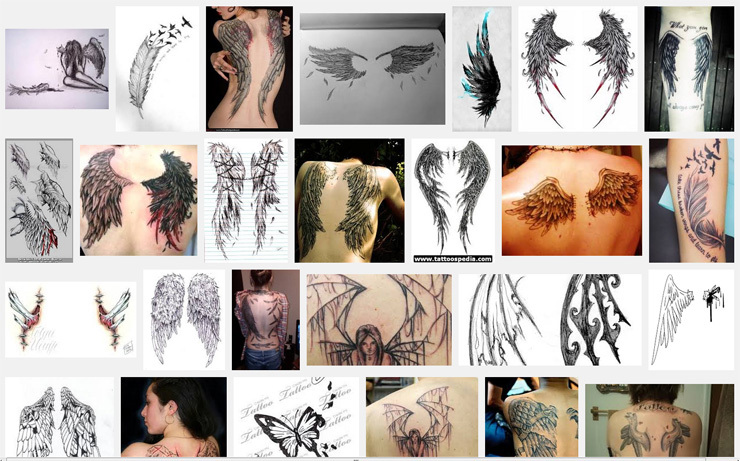 Another way to demonstrate your status as a fallen person is to get a tattoo of an angel with broken wings. 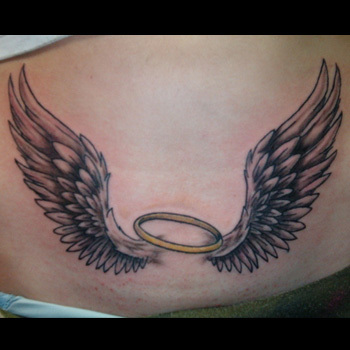 This design can be done with either the full angel or just its wings, and can be placed almost anywhere on the body. 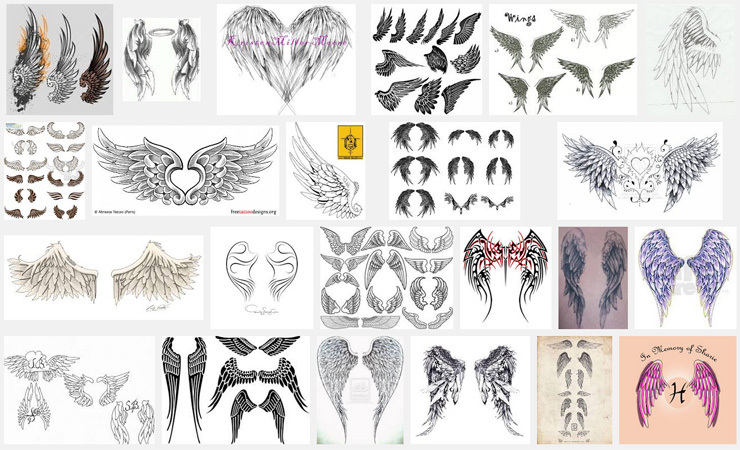 One good design choice would be to place the broken wings on your back, like a typical angel wings tattoo design, in order to demonstrate that you see yourself as a fallen angel. 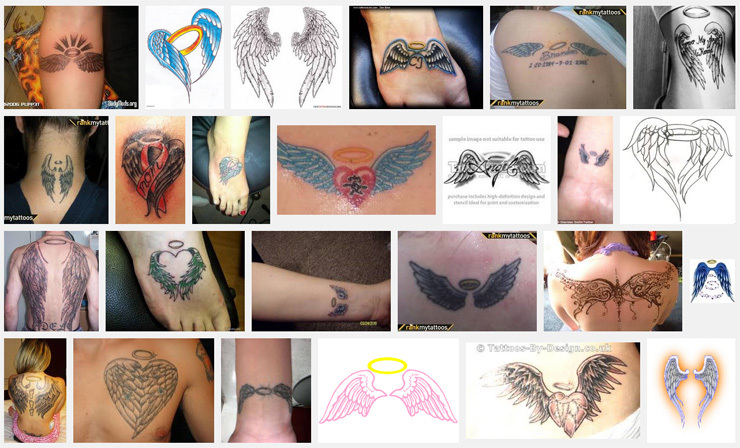 If you choose to design your tattoo to include the whole angel, a good idea is to have the angel looking plaintively up to heaven, as if searching for redemption. 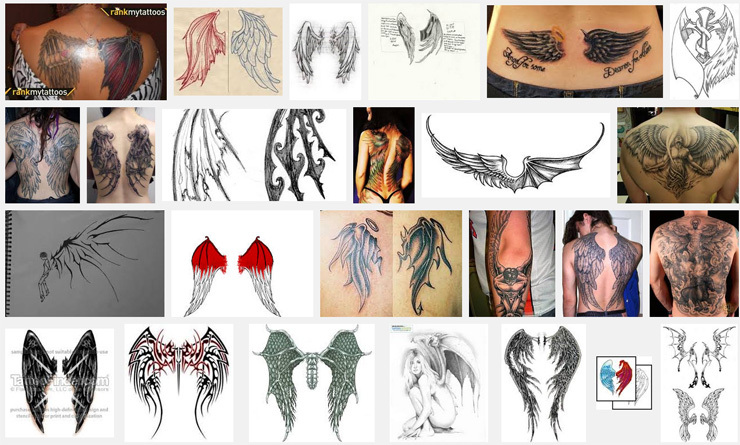 A further spin on the 'fallen angel' tattoo design is to depict the wings as devil wings. 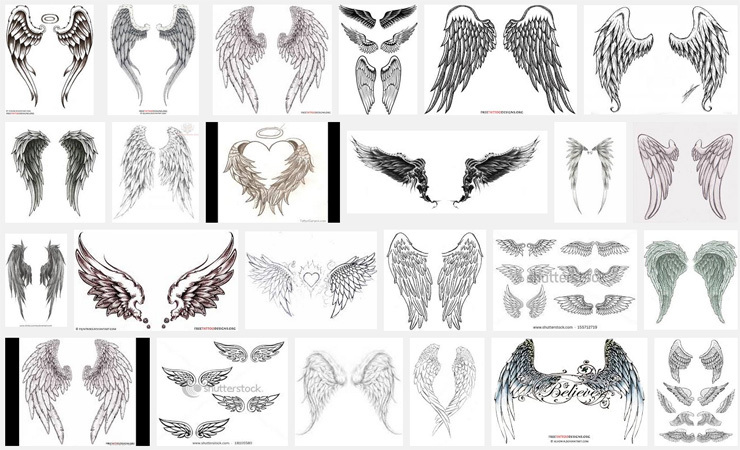 To do this, design your wings to incorporate colors like red or black, or have the wings appear as bones or rotten flesh: any of these design choices will make it immediately evident that this is not your typical angel wings tattoo! To further emphasize the devil aspect, place red or black horns above the wings. 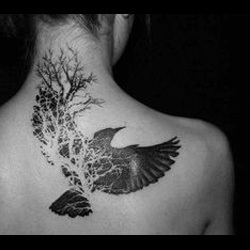 This tattoo looks great as a full-back piece, but it also works well on the bicep or leg. 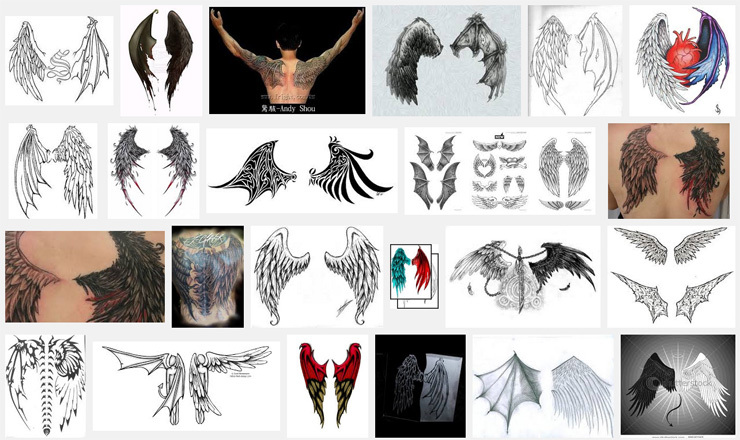 Getting a tattoo of demon wings is a great alternative to traditional 'fallen angel' tattoo motifs, and will allow you to get creative with the design. You can use any sort of color that you feel represents your personality and potentially demonic state: for instance, red for anger or rage, green for envy or greed, and pink for lust or desire. 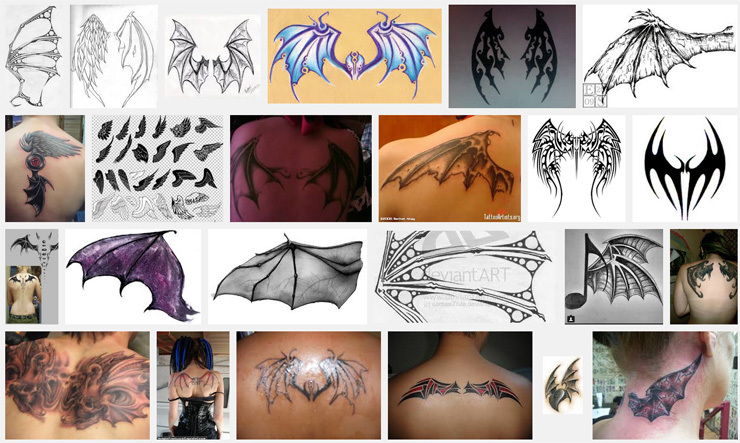 You can also create a unique style for the wings, such as scaled like a dragon's or paneled like a bat's. 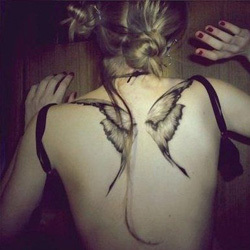 Placing this tattoo on your back is a classic location, though you can choose to put them anywhere on your body, and make the wings as large or small as you see fit. 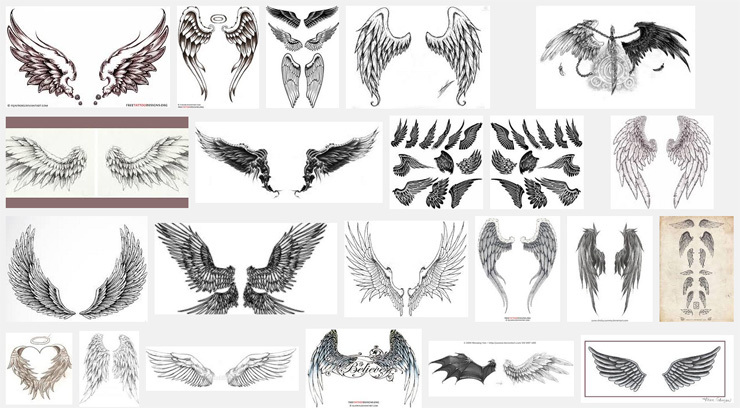 The duality of human nature is perhaps best expressed in the conflicting image of angel and demon wings. 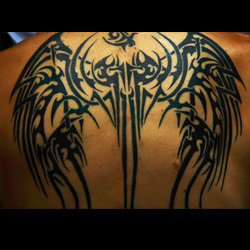 This tattoo design consists of one angel wing and one demon wing, and looks especially good as a whole-back piece. Your imagination can reign free in the design of the wings: perhaps you want the two wings to be white and black, to symbolize the antagonistic nature of these two creatures, or you may choose to have the demon wing be done in a particularly gruesome fashion. This is where your personality can shine through, so work with your tattoo artist to determine how you can make this design capture the best representation of yourself. Eagles are incredibly majestic and powerful creatures, and getting a set of eagle wings tattooed on you will demonstrate your affinity with this noble bird. The eagle wingspan can be designed to go across your shoulder blades, or scaled down to fit a smaller area of your body. 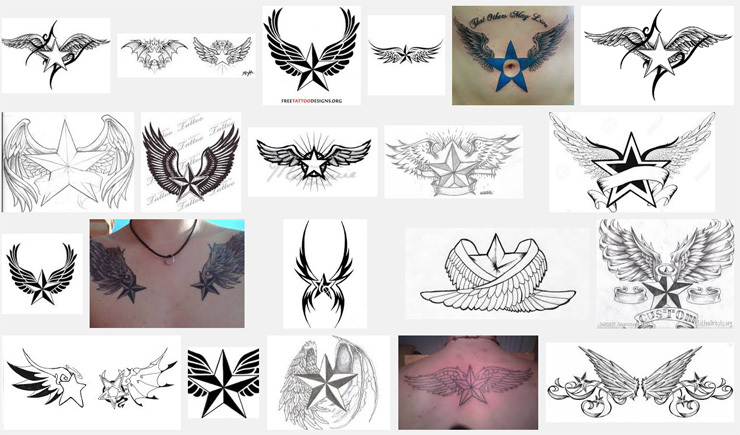 Those wishing to represent their American patriotism through the wings of a bald eagle can design the tattoo so the stars and stripes of the American flag are depicted within the wings. 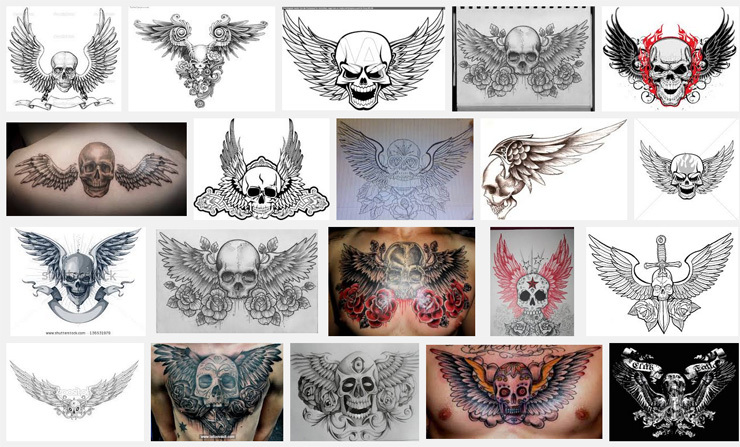 While eagle's are a popular set of bird wings to get tattooed, these wings can come off as a bit too masculine for many female tattoo enthusiasts, or a bit too 'American' for others. There are several other birds whose wings you can get tattooed, however, so you don't have to limit your options to the eagle! One great design to get the wings of a phoenix tattooed: this bird was able to rise again from the ashes, and a tattoo its wings, done in vibrant reds, purples, and yellows, will demonstrate to others your own ability to get through anything. Bird wings tattoos can be full-back pieces or delicate symbols for your ankles and wrists, and the color possibilities are open to your imagination and interpretation! 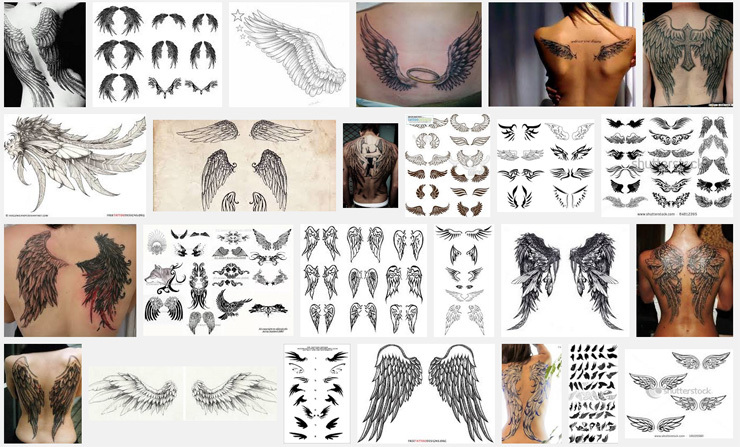 Fairy wings are a beautiful choice for a tattoo, and are great for anyone with a whimsical side or love of fantasy. Often these tattoos are done in a delicate fashion, with a light outline or almost feathery consistency to portray the ethereal essence of a fairy. The best colors are also light and airy in nature, such as pastels, though more earthy hues can be used, too. Consider making this a full-back tattoo in the same vein as an angel wings tattoo, or behind your ear or inside your wrist for a more feminine tattoo. Butterflies are known around the world for their ability to emerge from the cocoons of the humble moth. 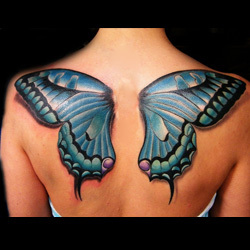 Therefore, a butterfly wings tattoo is a symbol of your own ability to transform and metamorphose, emerging from a challenging or bad situation as a stronger being. The unique and beautiful colors of butterflies also make this tattoo design perfect for anyone who wants to express their personal aura through a particular palate. 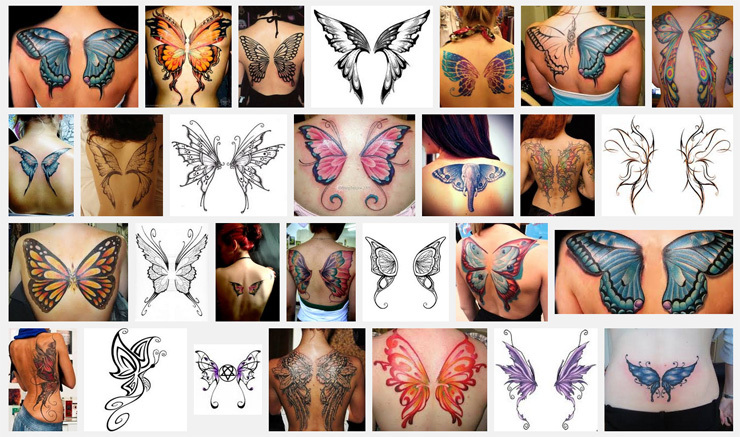 Just remember that symmetry is the key in butterfly tattoos! 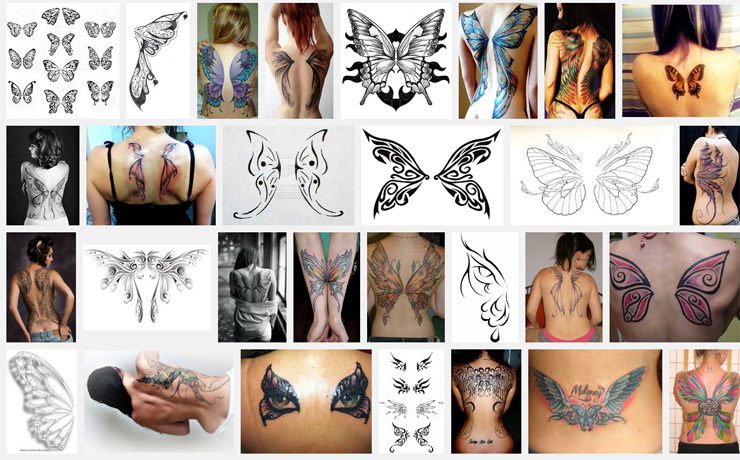 Placement of these tattoos is also a matter of personal preference: the small nature of the butterfly means its wings can fit just about anywhere on the body, but you can also enlarge the wings to create a full-back set for yourself! 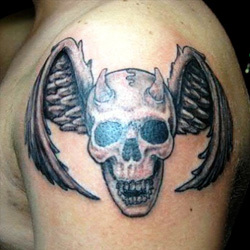 Though this tattoo may initially seem somewhat menacing, there is actually a profound meaning behind the skull with wings tattoo. These conflicting images, the skull a symbol of death and the wings a symbol of life and freedom, come together to make one image that represents how death can free us from the burdens of life, or that a human soul has progressed through to the afterlife. This design can be personalized in several ways: for instance, if you want the image to represent the passing of a loved one, you can include their name or initials underneath the skull. This design is often done in greyscale, though you can add colors to make the skull in a 'Day of the Dead' style, or if you'd like the wings to be a specific color. This tattoo is often done using a nautical star, which can be a symbol of the Navy and Coast Guard or of seafaring life in general, and usually denotes the passing of a loved one on the sea. 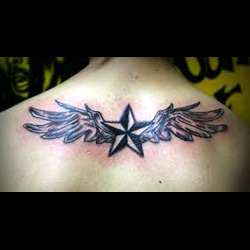 Unlike many other wing tattoo designs, the star with wings is not often a full-back tattoo across the shoulder blades, but rather might be done over the heart, thereby in a place of reverence, or on the inside of the wrist, serving as a constant visual reminder of the loved one lost. The nautical star can be done in several different colors, so think of choosing the favorite color of the loved one or simply sticking to a classic black and white design. 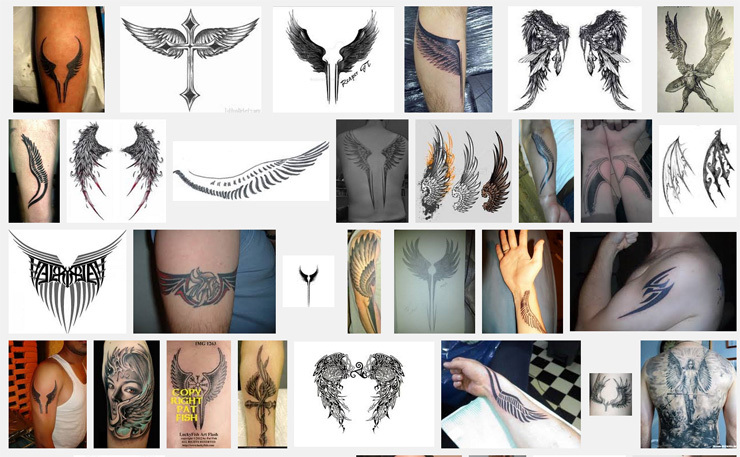 Getting a tribal wings tattoo is a great way to demonstrate both an important aspect of your personality (such as your quest for freedom or religious beliefs) while also highlighting your native or ancestral culture. 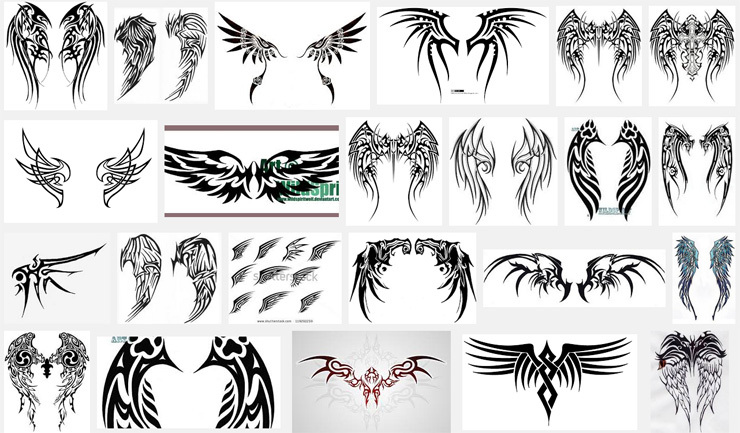 Some popular tribal wings tattoo designs utilize Celtic symbols such as interlocking knots done in intricate patterns (often in green and/or gold), while others stick to the traditional block black design of tribal tattoos. 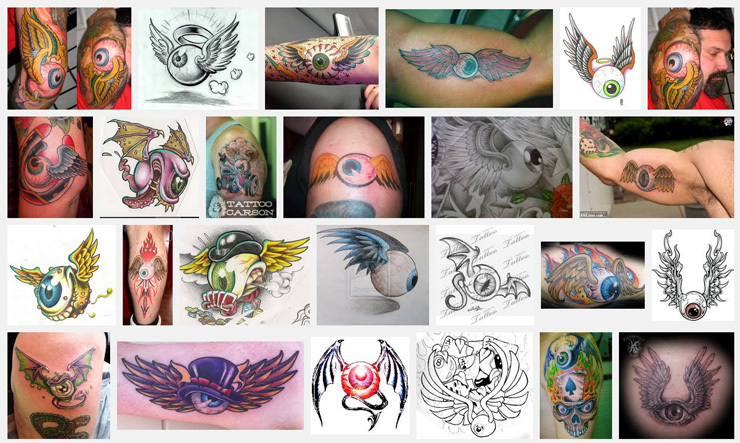 If you decide to go with the traditional tribal design for the wings, consider personalizing your tattoo through the use of color, such as those in your country's flag, to add a unique touch. 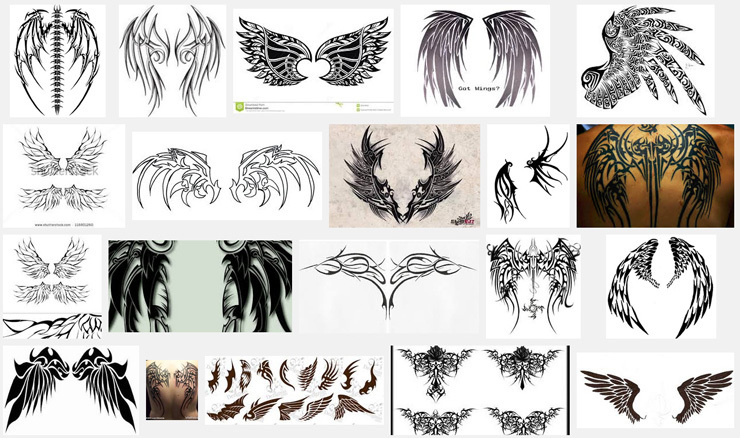 The Valkyrie wings tattoo is great for women, for those interested in Norse mythology, or for anyone of Norse heritage. Within Norse mythology, the Valkyrie were women who chose the bravest men to go into battle, and then flew over the battlefields to offer their protection. 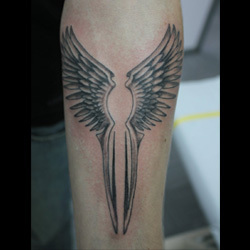 This design is unique from other wings tattoos due to the elongated nature of the lower wing, as it tapers off all the way down the length of the spine. 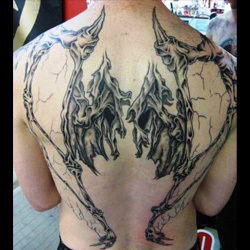 This makes it a great design for a full-back piece, and while the wings are usually represented as solid black or thickly outlined in black, consider choosing a color for the wings to make it more unique. Guitar tattoos are popular with musicians across the globe, but they can also be appropriated to symbolize life on the open road. 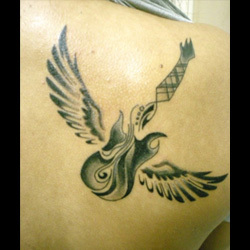 Getting a guitar with wings, or flying guitar, tattoo can be used to represent the passing of a loved one who was an avid guitarist, or the belief that music can set you free. There are a couple of great ways to personalize this tattoo. First, have the guitar be the one that you (or your loved one) use: you can even bring in a picture to your tattoo artist so they can ensure the design faithfully replicates your instrument. Another great way to personalize this tattoo is to have a ribbon of text with your favorite song lyric across or underneath the guitar with wings. This symbol was made famous by Von Dutch, an artist who was a pioneer of car customization. The flying eyeball design he created in 1948 has been used on countless cars over the years, so this design is perfect for any lover of classic automobiles, but the image itself can have a deeper, more symbolic meaning tied to ancient Egyptian and Macedonian cultures. Within these cultures, the flying eye was a symbol demonstrating how the all-powerful 'eye in the sky' knew and saw everything, thus making this a symbol of omnipotence and power. 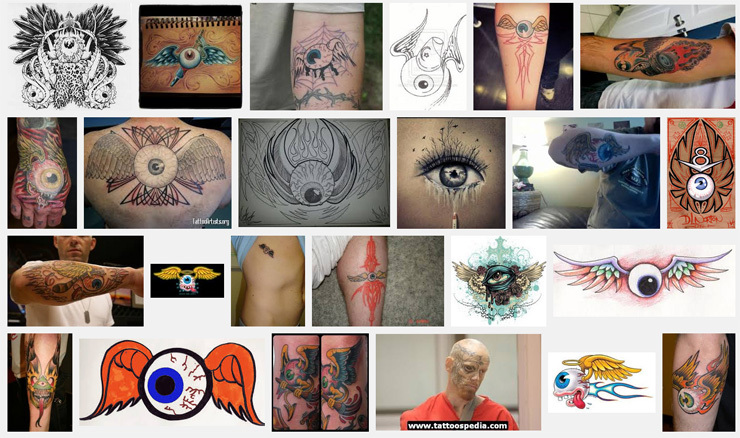 Those wishing to customize this design might consider placing the flying eyeball onto a tattoo of their favorite car, or getting a hieroglyphic underneath the eyeball of a particular word or phrase that is meaningful to them. 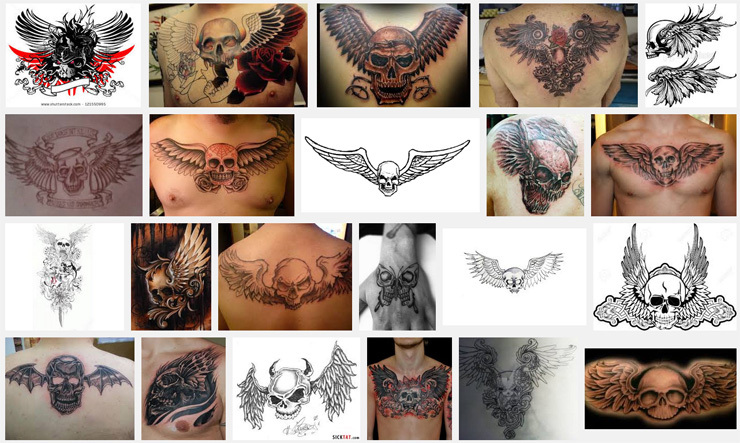 There are seemingly endless ways to customize and personalize a wings tattoo, making it a great choice for any tattoo enthusiast. 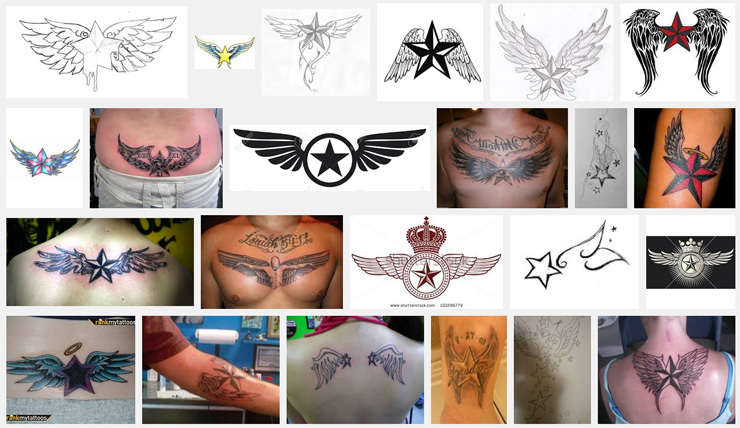 Whether you are getting wings to remember a loved one, demonstrate an aspect of your personality, or in homage to your favorite car customizer, there is a perfect wings tattoo out there for everyone! 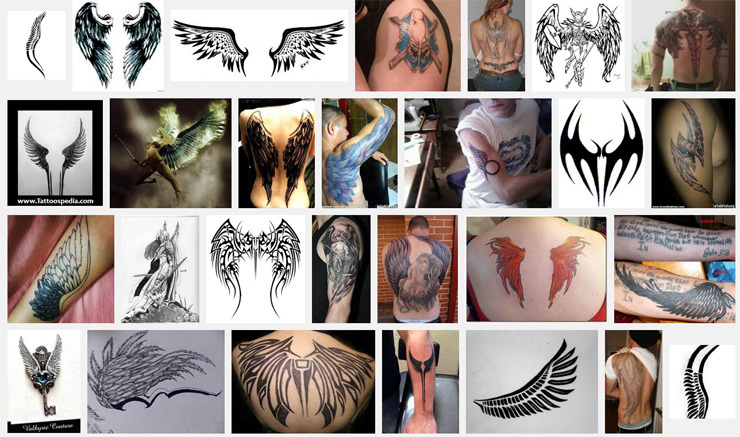 For custom design of Wings, you can check our Custom Tattoo Page.